Designed by sculptor Sir Anish Kapoor and engineer Cecil Balmond, the ArcelorMittal Orbit is one of the most striking and enduring visual legacies of the London 2012 Olympic and Paralympic Games. Its extraordinary looping structure has become a byword for design innovation and playful invention. Made of 35,000 bolts and enough steel to make 265 double-decker buses, the ArcelorMittal Orbit offers extraordinary 20-mile views over Queen Elizabeth Olympic Park and the London skyline. 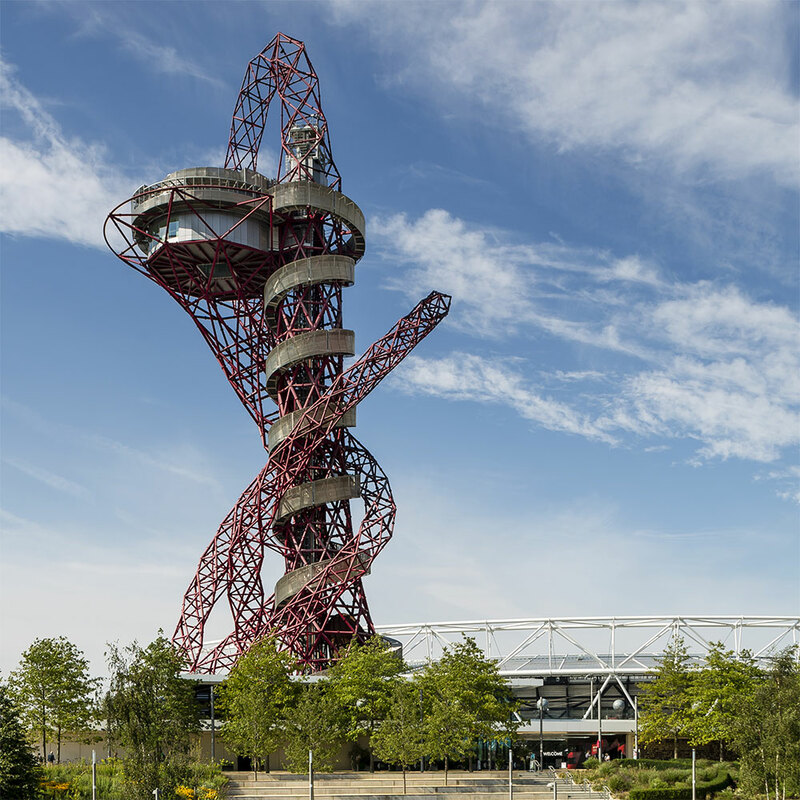 Steel was partly chosen as a building material for its infinite recyclability – 60% of the ArcelorMittal Orbit is made from recycled steel, including washing machines and used cars. The ambitious plan to build the ArcelorMittal Orbit came from a chance conversation between former London Mayor, Boris Johnson, and Lakshmi Mittal of the world’s largest steel company ArcelorMittal. The Mayor mentioned the idea of creating a landmark to commemorate the London 2012 Games and Lakshmi Mittal immediately came on board with the project – committing ArcelorMittal to provide the steel to build the structure. ArcelorMittal make steel in more than 20 countries with a presence in over 60. They see steel as being the “fabric of life”, as much of what of we take for granted depends on steel, including the vehicles we travel in, the machines that wash the clothes we wear, the buildings we live and work in, and even the cutlery we use when we eat. The ArcelorMittal Orbit is made from 600 pre-fabricated star-like nodes. These were precision-built by a team of 100 staff in Bolton, Lancashire and assembled on site by four men and a crane. This created the superstructure of the sculpture before the lifts and interior viewing platforms were added. There are four uses for steel in the ArcelorMittal Orbit; the red super-structure, the spiral stairs, the Corten steel of the canopy and the highly polished steel mirrors in the upper viewing platform, designed by Sir Anish Kapoor. 35,000 bolts were used in the construction and it would take 954 steel drinks cans stacked on top of each other to reach the top of the sculpture. The ArcelorMittal Orbit delighted 130,000 visitors during the Games and reopened on 5 April 2014, when the south of Queen Elizabeth Olympic Park reopened as a beautiful new open space for London, with meadows, wetlands and waterways.